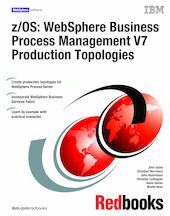 In this IBM® Redbooks® publication, we address the configuration, administration, and security of the key runtime environments in business process management: WebSphere® Process Server V7.0 and WebSphere Business Services Fabric V7.0 for z/OS®. This book provides detailed guidance to z/OS system and database administrators who want to configure WebSphere Business Process Management production topologies. We introduce production topology concepts and terminology and explore the differences between production topologies on distributed platforms and z/OS. Through a series of step-by-step instructions, you will learn how to create and verify a production topology environment for WebSphere Process Server V7 for z/OS. We extend the production topology concept for WebSphere Process Server by describing step-by-step how to add WebSphere Business Services Fabric V7 for z/OS into the topology. You also get problem diagnosis and prevention guidance to use when you create your own production topologies. A separate publication that covers distributed platforms is also available: "WebSphere Business Process Management V7 Production Topologies," SG24-7854.